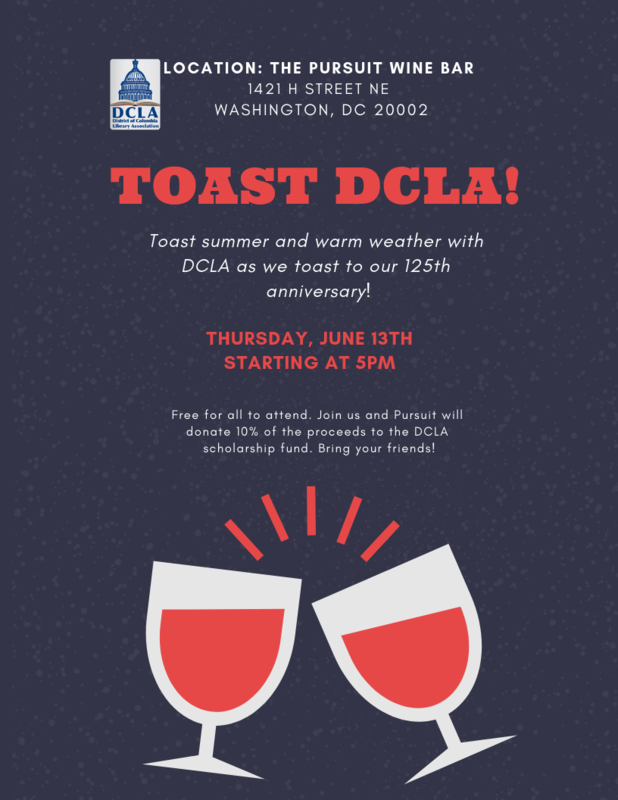 Show your love to DCLA as we toast our 125th anniversary at The Queen Vic! Free to attend for all. 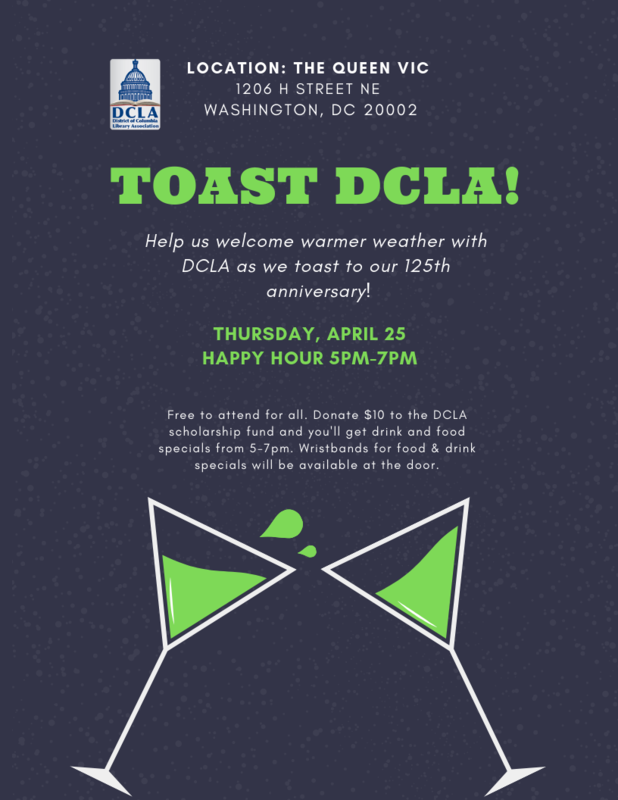 Donate $10 to DCLA and you'll get drink and food specials. RSVP and donate now to get your food and drink special wristbands at the door. "'Tis one thing to talk about privacy and intellectual freedom in the abstract, but do we connect these notions explicitly to concrete digital literacy? The aim of this workshop is to reveal, frankly, how some information is “read” in computers, how persons can better educate themselves and their friends and family in the area of digital privacy so each person can take his or her knowledge beyond simply content into the realm of digital context. This aim brings together the direct-action option of making a few adjustments to a user's app settings by embracing a revised model of lifelong learning. The result more fully integrates the user’s own use of digital tools and their training of others to simultaneously provide better privacy and to educate each person about using digital tools more intentionally – even mindfully"
Please bring whatever devices you use: laptops, tablets, Chromebooks, phones etc. We will use the library's publicly accessible WiFi to take our digital privacy to the next level with Jesse Lambertson, an academic librarian in Washington, D.C.
Waivers to attend will be provided. Monthly DCLA Executive Board Meeting, open to all members and the public. Directors report on their activities. 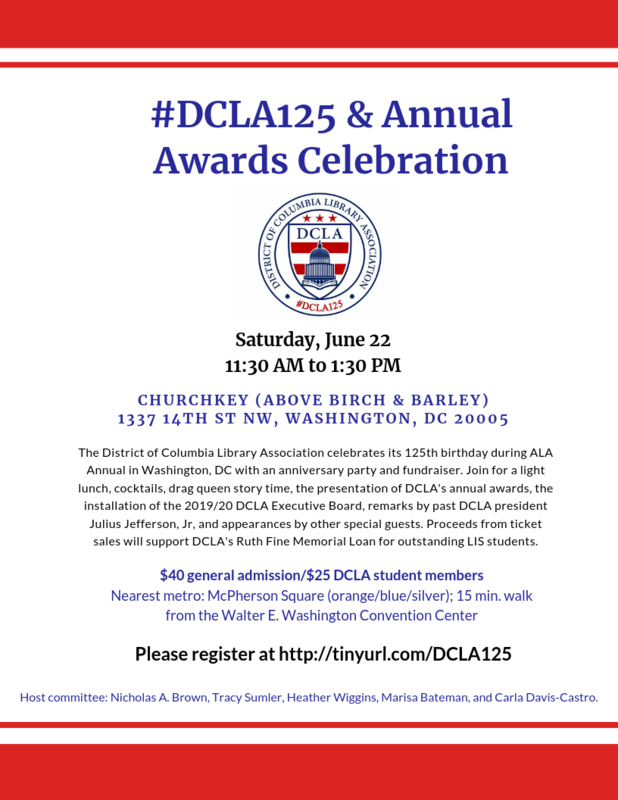 Current DCLA members are invited to receive $50 off registration using the code DCLA50. Save on Full Conference, Exhibits Only, or Single Day Pass registration. 19 Apr 2018 DCLA Executive Board Meeting CANCELLED!!! 18 Apr 2018 Briefing: What's New in Copyright? 06 May 2017 Gloria Gaynor Live: Disco Dance Party SOLD OUT! 29 Sep 2016 Celebrate the Freedom to Read! 06 May 2016 DCLA 2016 Board Elections End Today! 16 Apr 2016 Job Search Workshop: Writing Job-Winning Resumes & Giving Great Interviews! 07 Apr 2015 DCLA Spring Social: Trivia Night! Meet the 2015 Board Candidates! 21 Mar 2015 Job Search Workshop: Writing Job-Winning Resumes & Giving Great Interviews! 07 May 2014 Craft Your Personal Brand! 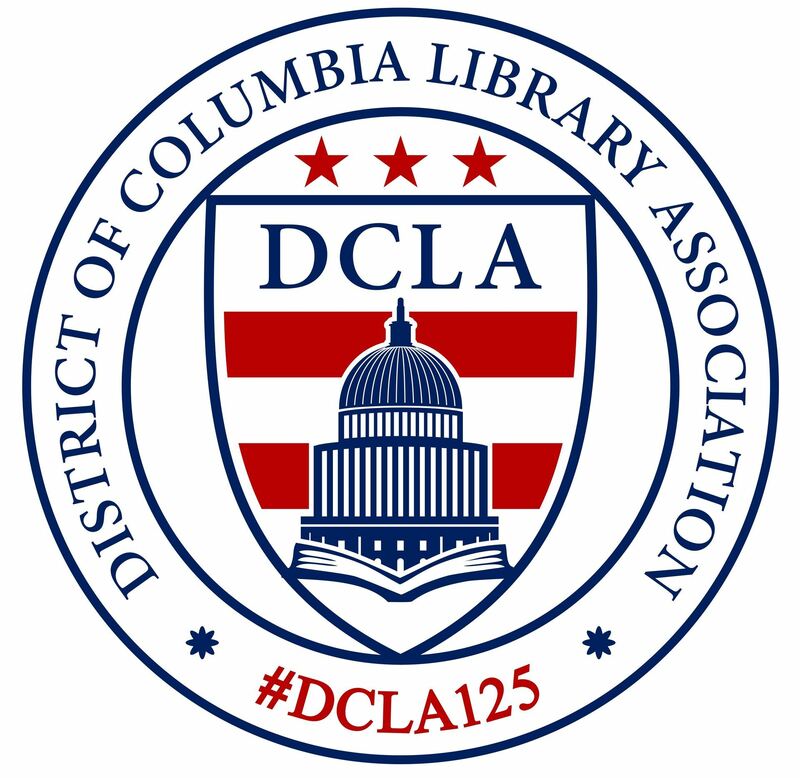 27 Jan 2014 DC Area Health Sciences Libraries (DCAHSL) meeting! 22 Jan 2014 How to Stand Out at the Right Time to the Right People. 05 Dec 2013 Screening and Discussion of "Green Fire: Aldo Leopold and a Land Ethic for Our Time"
19 Nov 2013 The return of the “Resume Swap”! 19 Nov 2013 LITA Forum Lightning Round-Up! 25 Oct 2013 Wikipedia Loves Libraries at the Smithsonia​n! 04 Dec 2012 Documentary Screening: Jim Hubbard’s "United in Anger: The History of ACT UP." 14 Oct 2012 INALJ Party! 14 Mar 2012 DCLA Spring Party hosted by National Museum of Women in the Arts! 08 Nov 2011 CUA-SILS Program - Library and Information Science and Intelligence Analysis: Converging Educational Paths? 07 Jul 2011 DCLA Member Tour of Provisions Library! 16 Feb 2011 DC/SLA Military Libraries Group Lecture and Dinner-- Nelly Lahoud Discusses “The Jihadis’ Path to Self-Destruction"
14 Dec 2010 Artisphere Tour for DCLA Members! 17 Feb 2010 Library of Congress Lecture: "Give My Poor Heart Ease: Voices of the Mississippi Blues"